Candy Crush, Candy Crush, Candy Crush. What have you done to me?! I used to be a functioning, socializing, engaging individual. Now? Hunched over my iPhone trying to get that one double striped candy combination to win the level. Playing. Just. One. More. Game. Ignoring my exasperated husband’s demands that I put my phone down. Pushing the cat off my lap (he affects my ‘game’ arm with his cute nuzzling). How did it come to this? Why is it so addictive? Why can’t I stop? Being a glass half full girl, I believe it is the ‘hope springs eternal’ attitude. Every time I play I keep thinking, “ah well, the NEXT time I will definitely pass the level.” But then it doesn’t work out. And I am SO close. So I try again, having learnt from the last attempt what the pitfalls are. Nope. No go. So I go again. And again. And again. Then I hit the brick wall of ‘no lives’. 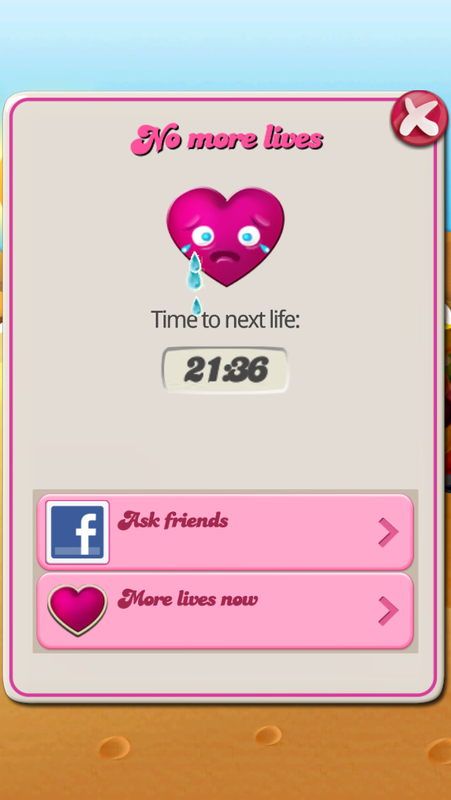 No more lives for the next 30 minutes?! Aarrgghhh! I just need one more life and I will definitely get to the next level. So, and I admit this only to close friends, I reset the clock on my iPhone to trick Candy Crush Saga into giving me more lives. Sometimes I do that two or three times. That’s fifteen attempts in about half an hour. I am so ashamed. I have read lots of articles on the addictive qualities of Candy Crush and most of them centre on the fact that there is enforced downtime, you HAVE to stop even if you don’t want to. So the game always leaves you wanting more. And it is a deceptively simple game to start with; you line up a few candies of the same colour so they explode, and repeat, to reach a certain number of points. But then the levels start getting harder; suddenly you are dodging chocolate that ‘eats’ your candy, extricating your candies from cream, trying to line up candies to get rid of the ticking time bombs, using licorice to block chocolate, sometimes doing all of this while racing against the clock. It’s heady stuff! My addiction was tragic. One day I decided to go cold turkey and I’ve never looked back. Very liberating! Good luck, whichever way you go.